On November 6, 2012, Kristen Thompson et al. announced in Current Biology that a set of whales that had beached in New Zealand in 2010, tentatively identified as Gray's beaked whales, had been genetically identified as the world's rarest whale- the spade toothed beak whale. The Spade Toothed Beaked Whale is considered the world's rarest whale because it has never been previously seen alive- its taxonomical descriptions stem from a single mandible what washed ashore in New Zealand, and two skulls sans mandible found in New Zealand and Chile. The Spade Tooth Beaked Whale Specimen washed ashore in New Zealand, 2010. When I heard this news, my true naivete about the size of the ocean, and human knowledge of it, came to the forefront. I initially questioned if this might be a case of a Lazarus Taxon- a term used by biologists and paleontologists to describe a phenomenon where we encounter an organism alive that we previously believed was extinct because of its appearance and eventual disappearance in the fossil record and a lack of live sightings. One of my favorite Lazarus taxon (yes I am that dorky) is the Coelacanth- a lobed-finned viviparous fish. It was believed extinct, but rediscovered in South Africa in 1938. Subsequently, another species of Coelacanth was recently discovered in the Indian Ocean, prompting some investigators to believe that there could be more Coelacanth species hiding in the vast ocean that we just haven't found yet. Probably the most popular and unconfirmed Lazarus Taxon is the Ivory Billed Woodpecker, or the Lord God Bird, supposedly spotted in the swamps of Arkansas and Florida between 1999 and 2006. Originally believed extinct in 1987, it has garnered quite a bit of publicity as questions of authenticating sightings and the importance of environmental protection played out after it was spotted in a protected region of Arkansas swamps by a kayaker in 2004. I'm not the only person with an obsession with Lazarus Taxon- check out the artwork of Dario Robleto- it's an intense discussion of this group of organisms (his work on Lazarus Species is juxtaposed with work on the oldest people in the world and, I think, sincerely speaks to the ideas of being singular organisms and the fragility of life. In a word: Intense). So, back to the initial discussion, I thought: Beaked Whale = Lazarus Taxon. We never see them alive, we don't know if they are still alive, etc. Gotta be, right? Wrong. I was recently at an academic conference in San Diego having a discussion with Erick Peirson, who is no slouch when it comes to knowledge about cetaceans and especially whales, when I mentioned my ideas about Lazarus Taxon and beaked whales and such. Get a couple drinks in me and I burst out in all kinds of totally awesome conversations about non-interesting things! He immediately set me straight. Beaked whales, and not merely the spade toothed variety, are all pretty hard to spot. The ocean, apparently, is huge and these creatures love the deep waters of the open ocean (aka where humans don't really hang out). Within the ocean exists these crazy beaked whales (and other stuff), rarely seen, but presumed to be down there somewhere doing whatever it is that beaked whales do. Studying these organisms is apparently a study in frustration. However, assuming that everything humans don't encounter in the ocean is extinct would be ridiculous. After this conversation, something began to nag at my mind- I had heard of beaked whales before I came across this story. But where? It turns out that I had seen images of the specimen used to name another beaked whale: True's Beaked Whale. While working at the Smithsonian Institutional Archives, I came across a field notebook kept by several research assistants at the newly established United States Bureau of Fisheries laboratory at Beaufort, North Carolina. 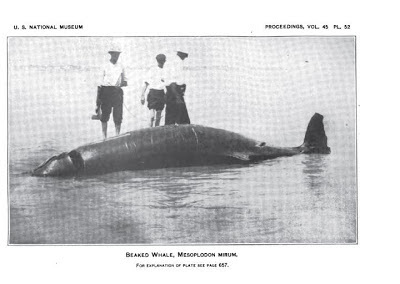 During the summer of 1912, an unidentified species of whale was stranded on the beach at Beaufort. The specimen was cut up (you can see the head has been severed prior to picture taking below) and shipped to Frederick True, a curator at the Smithsonian at the time. The image of the beached whale sent to True by the director of the Beaufort Laboratory in 1912. True described the new species, and it's common name comes from his surname. The picture of True's whale looks pretty familiar, eh? 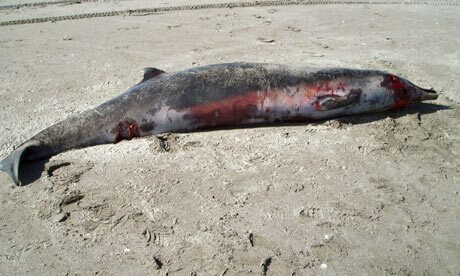 Just like the picture from 2010 of the spade toothed beaked whale found in New Zealand. These creatures are most commonly seen in this form- as beached forms that allow a small, and limited, glimpse of what lives in the ocean. So let this be a lesson to me- the ocean is huge, and our understanding of what lives in the ocean is very different from our understandings of terrestrial animals. If we don't see a tiger in the wild for 140 years and everyone has looked, it might be extinct. In the ocean, it may just be hanging out in the rest of the ocean. Investigators are still bound by what they can see, and in the case of the ocean environment, our vision is terribly limited- so much so that naming cetaceans and recognizing their existence means they have to basically come to us! These animals are so hard to spot alive in the wild that a new project is seeking to collect sightings in one place to help improve our knowledge of these organisms. Check out The Beaked Whale Resource, and if you happen to spot a beaked whale, let them know (and leave a message on this blog because that would be awesome). Happy beaked-whale watching.